One of the aircraft found by the Allies in Bad Langensalza was this A-9 from II./JG 301. The camouflage colors are RLM 81/82 on the upper surface and RLM 76 on the sides and lower surfaces. The yellow-red tail band identifies the aircraft as being attached to JG 301, while the horizontal stripe (yellow in this case) was applied on IInd Gruppe airplanes. Spojenci nalezli tento stroj po obsazení letištì Bad Langensalza. Letoun nese kamufláž barvami RLM 81 a 82 na horních plochách, boèní a spodní plochy byly nastøíkány RLM 76. Èerveno-žlutý pruh okolo zádì identifikoval stroje patøící do JG 301, vodorovný pruh, zde žlutý, pak letouny II. Gruppe. Period color photo confirms that this A-9 was camouflaged in RLM 81 and 82. The fuselage sides were darkened with thin layers of these brown and green colors. The engine and fuselage gun cowls are relacement parts and were in a darker color, probably RLM 83 green. The rudder, another replacement part, retained its factory RLM 76 color. The Werk Number on the tail is not fully visible in the picture, and we are speculating 260147. Dobová barevná fotografie této A-9 ukazuje standardní zbarvení barvami RLM 81 a 82. Boèní plochy jsou ztmaveny tenkým nástøikem hnìdé (81) a zelené (82) barvy. Kryt motoru a trupových zbraní jsou vymìnìné a nesou tmavý nástøik, zøejmì tmavì zelenou RLM 83. Smìrovka byla rovnìž vymìnìna a zùstala v továrním zbarvení RLM 76. W.Nr. na SOP není zcela zøetelné, jeví se jako 206147. Remarks:WIA 14 January, 1945 during aerial combat near Kyritz. Two known victories, a B-24 and a P-51, opposing the Misburg Raid on 26 November, 1944. On 24 August, Reschke claimed a further B-24 near Jindrichuv Hradec at 12:40, but shortly after, during an attack on a second, his aircraft was hit by return fire. Reschke wanted to force-land with a dead engine, but USAAF P-51 fighters began pouring fire into his Bf-109 G-6 'White 10' and he had to use his parachute. On 29 August, he shot down a USAAF B-17 four-engine bomber south of Zlin at 10:50. 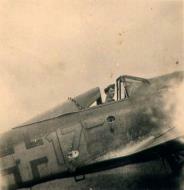 During the attack another Bf-109 fired on his Bf-109 G-6 "White 6" and Reschke had to force-land near Uherske Hradiste. By the end of August 1944, he had 14 victories to his credit. After re-equipping with the Focke-Wulf 190A-8, I./JG302 was redesignated III./JG301 on 30 September 1944. In October, the unit transfered to Stendal near Berlin. On 1 January 1945, Feldwebel Reschke downed a B-17 for his 22nd victory but was again hit by return fire and baled out of his Fw 190A-8 'White 6' east of Gardelegen. On 13 March, he was awarded the Deutsches Kreuz in Gold. In March 1945, Reschke transferred to the Geschwaderstab of JG301. On 14 April, he flew a Ta 152 and claimed a RAF Tempest fighter shot down. On 20 April, Oberfeldwebel Reschke received the Ritterkreuz. He claimed his last two victories of the war on 24 April, when he shot down two Russian Yak-9 fighters near Berlin.